Waaaayyyy back in my single days, every now and then I'd have a young man come over to my place for dinner. If I let the occasion slip to my mom she'd always advise, "make pot roast. Men love pot roast." To me, pot roast was something Marion Cunningham would make for Howard, Richie and Joanie (and Chuck, when he was around). It wasn't something you'd serve a hot date. Instead, my roommate and I both favored a deeelicious chicken casserole that included cream of something soup and canned artichokes -- and we added our own gourmet flair by adding a half a can of wine (which was probably white zinfandel). How did it go over? Let's just say that the casserole was eventually renamed "Lose a Boyfriend Casserole." The best pot roast is made in the slow cooker, but when I don't have my act together 10 hours before dinner is to be served, my fallback recipe is this one. Preheat oven to 325. Season the meat with salt and pepper. Heat 1 tablespoon oil over medium heat in heavy roasting pan; add the meat and brown on all sides. Transfer the meat to a plate. Add the remaining tablespoon oil to the pan. Add the celery, onion, and carrots and saute for 5 minutes. Add the stock, bay leaves, and ketchup. Return the meat to the pan and bring to a boil. Cover and transfer to the oven. Bake for two hours. Move the meat aside and stir in the thyme, salt and pepper. (At this point, the meat can be stored in the refrigerator until the next day.) Place the potatoes on the bottom of the pan, and rearrange the meat on top. Re-cover, and bake 45 minutes longer, or until the meat and potatoes are tender. In a small bowl, mash the butter and flour together until a smooth paste is formed. Transfer the meat to a large heated platter (my favorite is Armetale, which can go in the oven), and using a slotted spoon, remove the carrots and potatoes and arrange them around the meat. (Of course, you can serve them all separately, as shown here.) Discard the onions, bay leaves, and celery. Defat the pan juices. Bring the pan juices to a boil over high heat, then whisk in the butter mixture by tablespoonfuls. Cook over high heat until the mixture forms a gravy, the reduce heat and simmer for 3 minutes. If desired, add Tabasco to taste. Ladle into a gravy boat and serve with the meat and veggies. I love a good pot-roast, but good thing it's not the first thing I made my husband when we were dating - because it's one of the few things he doesn't like! I love that condensed soup story. I think they were lucky to get THAT! Impeccable pot roast recipe. I would just change one tiny little thing. I would add tomato paste instead of the ketchup. I just can't keep my opinions to myself. I'm such a busybody. Carol, I'll bet it was awesome. They are definitely best in the pot roast. Deborah, that was one of the arguments that I had with mom. Not ALL men like anything! Sue, I'll have to try the tomato paste in that recipe. I'll bet it would add a little more flavor and body. Although I think ketchup makes just about anything better. I love ketchup. Carol, I meant to say they are best in the slow cooker. Duh. Does he like pot roast? Gosh that looks good Tracy, I know what I want for Sunday dinner. Emiline, oh yes Charlie loves pot roast. We have to keep an eye on him! Ooh, how hearty and classic! Nice indeed. The pot roast looks great! Love the doggy in the back! It has been years (10+?) since I've had a pot roast... this sounds fabulous! How funny, this is just what we had for dinner tonight over at my mom's house. I love a good slow cooked pot roast. Yours looks delicious! 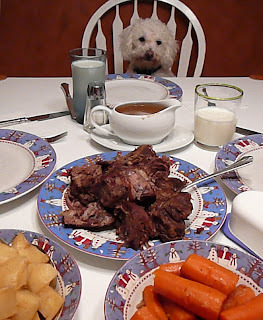 Even better is your cute little pooch sitting so nicely at the table! 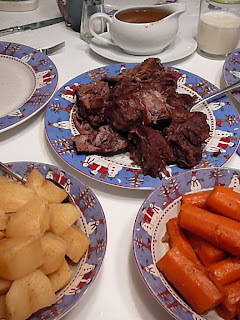 I'm embarassed to say that I've NEVER made pot roast....I am now inspired to try one....Thanks! Plain old brown rice. Perfectly cooked. My husband's idea of a joke (but it's on him). Chicken soup to the rescue!